Bosses were frequently placed where the ribs of a vault (or ceiling) met. They usually performed a functional role as well as a decorative one. Bosses used in cathedral vaults can be very large in scale. This small rectangular boss, once part of wooden church ceiling, has been carved in the form of a flattened and stylised rose with leaves at each of the four corners. The size of this example, and the fact that the back is flat and plain, indicates that this boss was used purely for decorative effect. This example is probably from Llanbadarn Fawr church, near Aberystwyth in Wales. This rectangular boss is in the form of a flattened and stylised rose with leaves at the angles. The inner circle of the rose consists of five petals, surrounded by a circle of seven larger petals, with four leaves in each corner. The back of the boss is flat and plain. There are four small circular holes, one towards the edge of each corner, which run through the full thickness of the boss. They can be seen on the front in the tip of each of the four leaves. There are also two larger holes which are arranged diagonally on the rear. These do not run through the full-thickness. Two modern metals plates, used to display the boss against a wall, have been screwed to the back. Bosses are often placed where the ribs of a vault meet fastening the ribs and therefore fufilling a structural role. Bosses used in cathedral vaults can be very large in scale. Structural bosses usually carried carved and painted decoration. When viewed close up the decoration on bosses from Gothic cathedral vaults can look crude or heavy-handed but such an approach was needed in order to make the decoration visible from ground level. This boss is very small in scale and cannot have peformed a structural function. It must therefore have been utilsied in a purely decorative fashion. In his catalogue entry Charles Tracey points out that bosses like this began to be used from 1400 onwards. He notes that bosses like this could be used to make a frieze on the wall plate or along each side of a tie-beam. Also that groups of four bosses were sometimes applied to the panelling at the four corners of a rib intersection where the ceiling was divided into compartments. The rose was commonly used in art of this period and it could carry different meanings depending on the context. For example stylised roses were incorporated into heraldic devices, and in other contexts the rose could carry religious symbolism. In this instance the overall impression is that the rose is used in a largely decorative capacity. This is underlined by the three other bosses related to this one which all feature stylised vegetation with serrated leaves prominent in each. 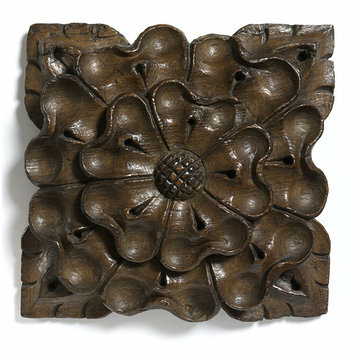 Boss, one of four (118-1908, 119-1908, 120-1908, 121-1908), from a roof, rectangular, in the form of a rose, with leaves at the angles. From Llanbadarn Fawr Church, near Aberystwyth, Dyfed. This type of non-structural boss is used in a purely decorative capacity in certain kinds of roofs from about 1400 onwards. It can be used to make a frieze on the wall plate or along each side of a tie-beam. Where the ceiling is divided into panelled compartments, at Ewelme, Oxon, for instance, groups of four bosses are sometimes applied to the panelling at the four corners of a rib intersection. An interesting three-dimensional composition can then be produced by placing a large boss at the point of intersection. Boss one of five (119-1865, 120-1865, 121-1865, 123-1865, 124-1865) from a roof, carved in high relief with conventional foliage, with a ﬁgure of a crouching lioness. (PL 2c, FIG. 3). These bosses are from one of the ﬁrst floor chambers of the extension to the Bishop of Exeter’s palace erected by Bishop Grandisson (1327-69). The new apartments were added to the extreme west end of the existing complex of buildings, substantially the work of Bishop Brewer (1224-44). The conjectural plan by H.M.R. Drury is reproduced in ].F. Chanter, The Bishop’s Palace Exeter, London, 1932.(p. 27). During his episcopate (1292-1307) Bishop Bytton had added some private rooms for his personal use to the west of Brewer’s Great Hall with a lesser hall above. By the early fourteenth century the palace was fully up-to-date in terms of amenities. Bishop Grandisson must, however, have shared his predecessor's aversion to the communal life of the great hall. He annexed the last piece of ground remaining at the west end of the complex to construct a self-contained hall for himself including an inner parlour with south-facing bay windows, and kitchens below on the ground ﬂoor, and two spacious chambers above. The addition had a frontage of over twelve metres, and a total depth of eighteen and one third metres. Unlike the rest of the palace it consisted of three storeys. Grandisson’s extension was demolished in the mid-nineteenth century. However, Charles Tucker, the cathedral’s architect, recorded the fact that one of the first floor chambers had been furnished with a ﬂoor of decorative tiles and a fine oak roof of ‘ornamental cross beams’ (Charles Tucker, ‘Notes on the bishop's palace, Exeter’, Arch.Jnl, v, 1846, p.224-25.). In particular, he mentions the bosses of this roof, one of which displayed the carving of a mitred bishop, wearing amice and chasuble. Another showed a female in a hood and both were surrounded by foliage. Two adjoining cross beams carried the arms of Grandisson and Montacute on separate shields. Tucker suggested that the bosses were portraits of Bishop Grandisson and his mother, who was of the Montacute family. He mentioned a third boss in the form of a crouching hound (this is presumably the museum’s lioness), and three other bosses of foliage only. He stated that there were traces of red, black and white paint, and gilding remaining on the sculpture. There can be no doubt that the V&A’s carvings are the ones described by Tucker. They accord well enough with the descriptions and the dimensions given. Given the pattern of lacunae in the records it seems likely that the building work was undertaken between 1335-40. If so, the wooden roof would have been designed by the master-mason, Thomas of Witney, in collaboration with the master-carpenter. From an inspection of the cathedral wages lists (Audrey M. Erskine, ‘The Accounts of the Fabric of Exeter Cathedral, 1279-1353', Part I: 1279-1326, Devon and Cornwall Record Society, N.S..Part I: Vol.24, 1981;p.175-211 and Audrey M. Erskine, ‘The Accounts of the Fabric of Exeter Cathedral, 1279-1353', Part II: 1328-53, Devon and Cornwall Record Society, N.S.. Part II: Vol.26, 1983. p.293-310) it does not seem that any of the craftsmen involved in making Bishop Stapledon’s choir furniture or structural woodwork was employed on the roof of his successor’s new palace extension. William of Membiri, the master-carver, was paid off when the work on the throne was completed. Robert of Galmeton remained as the cathedral master-carpenter until 1321. Nonetheless, the drawing of the heads on the bosses can be compared to that on the bishop’s throne. The angels and the man and woman on the cusp-ends of the great ogee arches of the throne share much in common with the later work. The treatment of the heads with broad and flat foreheads, sharply-cut brows, prominent cheek-bones, ﬂat and widely spread noses, cleanly modelled upper lip and thin wide-spread lips are common to both series. The putative Montacute portrait exhibits a particular way of drawing the edge of the upper eye-lid, by means of a prominent raised band, which is also found on the throne heads. The foliage on the palace bosses is akin to that on the throne. The leaves on the head bosses are of the most common type used on the earlier monument. The boss from the palace with a spiralling stem giving off budded shoots is also characteristic of much of the foliage on the throne. Finally, the tiny head of Stapledon on the tabernacle high up on the northern gable of the bishop’s throne provides an instructive parallel to the image of Grandisson, carved, presumably, some twenty years later. Of about the same date as the throne are the stone lion roof bosses in the east bay of the nave (FIG.3). Their carving style is very close to the treatment of the lioness from the bishop's palace. Again, however, the possibility of continuity of craftsmanship is ruled out by the fact that Richard Digon, who carved these stone bosses left Exeter to work at Wells Cathedral soon after 1313.